Does your website contain information about anything Australian that could help children with their projects? Does your site not have any "adult only" content? Do you want to receive more hits to your site? If the answer to all of the above questions was "Yes" - then this is the Webring for you! Help the children of the world and sign up now! The page that you register with this webring MUST be the page where you will put the html code and the graphic. Please download the graphic and load it on your own website - this will make it quicker for your visitors and will make sure that all of your graphics are available when your site is available. The website must be useful to school children around the world and contain information about Australia. 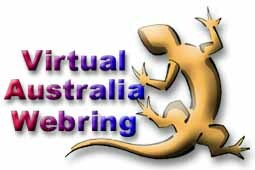 If your website covers more than one topic, the webring MUST be placed within the Australian section. If your webring is on a separate page then you MUST provide a link just below it to the relevant page or section. Help make the web a friendlier place for children! Fill in the form below with your relevant details. It will pass you through to the webring registration area once you press submit. Check that all of your details are correct then accept your information. Please take note of your ID number and other information. Your request will be placed in a queue and I will review your site and your code as soon as I can. While waiting for acceptance you need to download whichever graphic you wish from this page by right clicking on it and choosing "save as". Below the form are the code fragments for each graphic. You will need to exchange the ?? with your ID number. If your images are stored in a different directory to your html page - you will need to add the path in front of the graphic name. Don't forget to download the graphic you wish to use! Don't forget to change the ?? to your site ID eg. id=12 instead of id=?? 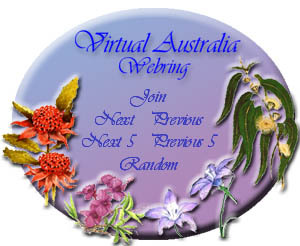 Email virtualaustralia@yahoo.com for further information. for failing to meet the criteria specified at the top of this page or for any other valid reason. No arguments will be entered into. 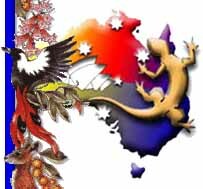 While you are here - why not browse the Virtual Australia site - it contains over 1300 pages of information on Australia for children's school projects.